Click on any page to be able to read it. 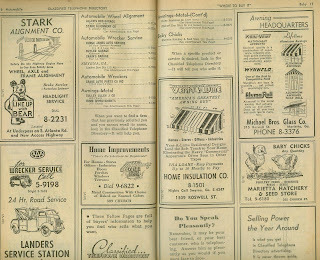 Here are some more 1954 Marietta Yellow Pages that faded to beige. 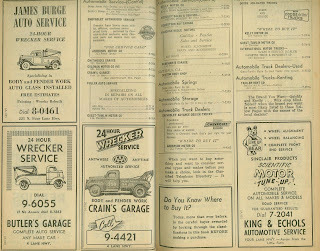 If you are my age I’m sure you recognize a lot of these companies that had their hand in the auto market. 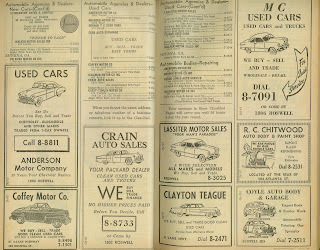 I see my late uncle Spencer Crain had several advertisements in the auto section, just about every opened to two pages Crain would have an ad. Remember Guest-Tumlin Motors on Cherokee Street, about where the deck parking lot is now? I remember it when it was Guest Motors. 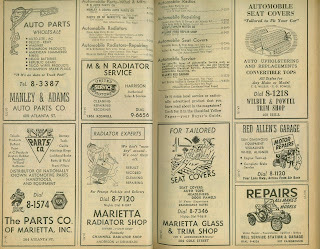 Anderson Motor Company had their new car dealership on Powder Springs Street – I remember that – but I don’t remember their used car section out on Roswell Street. According to the number it is probably the same land that all of Anderson Chevrolet finally ended up at. 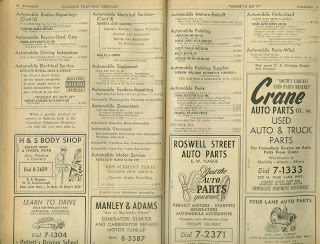 Also out Roswell Street just a short distance, about a block from the Greyhound Bus Station was Vaughan-Noble Pontiac. Again, I remember when it was Noble Pontiac. 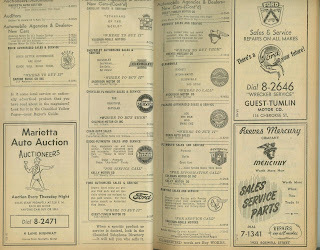 The last ad is Marietta Hatchery which I think was the store next to my uncle Herbert Hunter’s barber shop. I remember all the colored baby chicks in their window at Easter time.